"How Do You Kill 11 Million People?" We’ve all heard it said before, “Don’t judge a book by its cover,” but if you’re anything like me, you have to admit that there are books out there that you’ve read because of the cover. 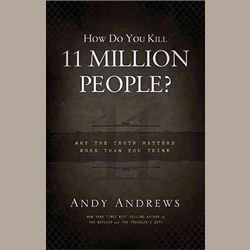 Such is the case with Andy Andrews’ newest release, How Do You Kill 11 Million People? I know, intriguing isn’t it? Now I have to confess, I am one of Andy’s biggest fans, and if he were to write a “how-to” book on watching paint dry, I would read it, but believe me when I tell you that this is one book that you need to read. I would even go so far as to say that it very well could be one of the most important books that you’ll ever read. Now I know what you’re thinking; that’s a pretty bold statement, but you have to admit — the title asks a pretty bold question, doesn’t it? Well, thankfully Andy doesn’t leave the question unanswered, and true to form, Andy’s writing once again employs his keen knowledge of history to bring the reader into a place of genuine reflection and challenges that reflection with a call to action. I don’t want to be one of those people who spoil the story for you by giving away all of the best details, but if I told you that the central idea contained in this book could help bring real change to our country as well as the world in which we live, you would read it, right? Besides, it’s an extremely short book (only 78 pages), and I for one have spent a lot more time thinking about the truth within its pages than I did reading them. I think you will too.